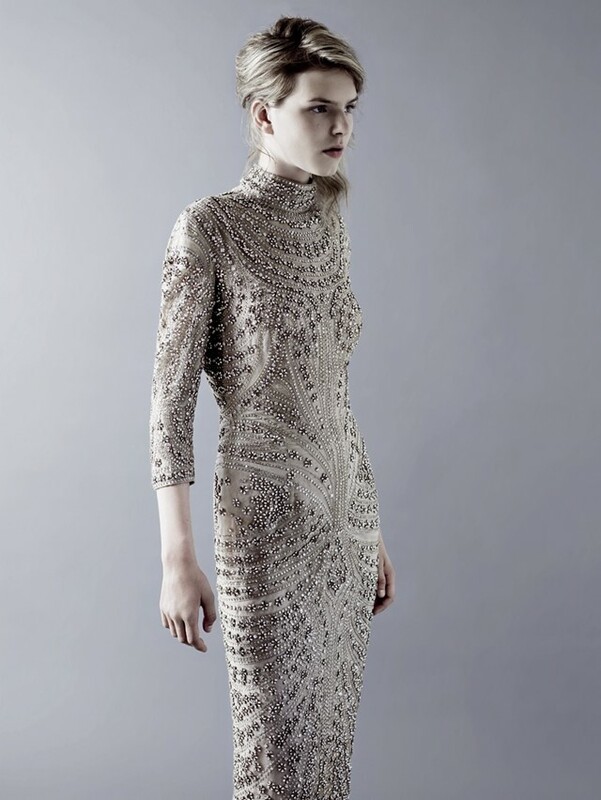 One of the things that Alexander McQueen is most renowned for is the intricately considered theatrics of his shows. “He was like an artist presenting a dream, a story, a performance,” collaborator Katy England told Susannah Frankel in the S/S15 issue of AnOther Magazine. “Here was this guy who not only showed clothes but put emotion onto the catwalk,” explained his first assistant, Sebastian Pons. The S/S04 Deliverance collection perfectly documents the textured layers of meaning that McQueen injected into his show narratives. What could have appeared a Strictly Ballroom-esque celebration of dancehall glamour was actually inspired by the tragic dance marathon in Sydney Pollack’s Depression-era film, They Shoot Horses, Don’t They?, where impoverished contestants desperately perform for their lives. Swarovski adorned dresses, shimmering lamé fabrics and feather boas were worn by models and dancers immaculately choreographed by Michael Clark. The immediate impact was of a glittering extravaganza – and yet there was a distinct undertone of melancholy to the frenzied performance. The silver dress that opened the show was the same that closed it – only, by the finale, the piece was dishevelled and tarnished, worn by a dancer who collapsed at the centre of the stage and was ultimately carried off by Clark and McQueen. The pace, and impact, of the show was literally exhausting – as it was in Pollack’s film – and as, McQueen seemed to be saying, it was in fashion; in the high-octane world of glamour he was offering us through sequins and immaculately-tailored denim corsetry alike. In 1997, he told Time Out, “I don't want to do a cocktail party. I'd rather people left my shows and vomited.” And, in Deliverance, a cocktail dress wasn’t just a cocktail dress. No matter how beautiful it appeared, it held a far more unsettling association, a resonance that epitomises McQueen’s legacy. As well as the powerful, 17-page photographic tribute to McQueen – shot by Nick Knight for the latest issue of AnOther Magazine and featuring the crystal-embellished catsuit from Deliverance – the visionary photographer also created an accompanying film capturing the essence of the story. Here, we present a preview of the mesmeric film, created in partnership with Swarovski, which can be viewed in full by visitors to Alexander McQueen: Savage Beauty at the V&A via a special booklet provided by Swarovski as a lasting memento of the exhibition. The images inside the booklet can be scanned using Blippar, the interactive smart phone app, to unlock the full length film, adding a layer of augmented reality to the experience. Alexander McQueen: Savage Beauty is at the V&A until August 2.